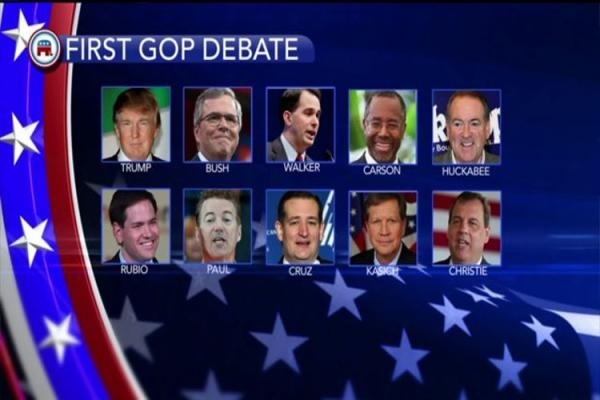 Tonight brings the first GOP presidential debate of the 2016 cycle, and with it, the elephant in the room. No, not Donald Trump — though the poll front-runner is supposed to be on the Cleveland stage. No one will be eager to talk about the enormity of the Republican field and how it will limit the ability of participants to distinguish themselves. When the Fox News debate starts at 6 p.m., 10 candidates will be on stage, selected based on polling that closed Tuesday night. The seven announced Republican candidates who didn’t make the cut will square off in an earlier forum, at 2 p.m.
That’s too many people for a conversation, let alone a debate for the most important job in the world. Moderator Chris Wallace has his questions at the ready inside a massive three-ring binder. “I’ve got some doozies in there,” he told The Washington Post’s Krissah Thompson. What is the core purpose of government? Should the federal government release control of some of its land to the states? If so, how much? Would you revive the federal government’s plan to store nuclear waste inside Nevada’s Yucca Mountain, or would you pursue a different nuclear waste storage policy? How would you reform the federal tax code? Should the federal government subsidize green energy? Do you support the legalization of interstate Internet poker, or would you seek to ban it outright? Should the ethanol mandate be repealed? Would you approve the Keystone XL pipeline from Canada upon taking office? Should the federal minimum wage be increased? Should juveniles have a lower minimum wage? Would you halt prosecutions of federal marijuana offenses in states that legalize medical and recreational uses of the drug? Would you change the way the federal government prosecutors the war on drugs? Would you reform or replace the Affordable Care Act? If so, what would your plan include? What would you do to reduce the growing costs of Medicare and Social Security? Should any federal agencies be dissolved or consolidated? Should the Transportation Security Administration and the Department of Veterans Affairs be privatized? Would you reduce military spending in pursuit of a balanced budget? Would you try to reduce federal power over the states and U.S. citizens? Would you support legislation allowing states to keep all federal fuel tax revenue and decide how to best spend it? Would you support a bill calling for concealed carry reciprocity in all 50 states for legal, licensed gun owners? Would you vigorously defend the Bill of Rights in the event of another major terrorist attack on the United States? Serious presidential candidates will have answers to these questions — good answers.